Can I transform Town Gossipmonger after an attack and it's unblocked? Town Gossipmonger flip and attack or no? SynergyBuild on White DON'T call us weenies! Add 4 Soldier of the Pantheons (better than Expedition Envoy), 4 Champion of the Parishs (like Thalia's Lieutenant but is a one drop, and half the abilities), 4 Gather the Townsfolks ((For Champion of the Parish, and Thalia's Lieutenant)), and finally a Plains and 2 Windbrisk Heights (Card advantage). 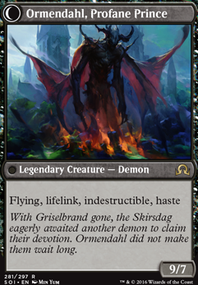 Switch Gideon, Ally of Zendikar for Elspeth, Knight-Errant, Gideon of the Trials, Ajani, Caller of the Pride, Ajani Goldmane, Ajani Steadfast, or Gideon, Champion of Justice although I like Elspeth, all of them are great in their own right. feels like to much removal, and not enough creatures (normal aggro need 26< creatures). Hamlet Captain is... bad if you don't play a lot of human tokens. Otherwise it's just 2/2 for 2 mana. Maybe Duskwatch Recruiter Flip, Hanweir Militia Captain Flip, Heron's Grace Champion, Town Gossipmonger Flip or just Lambholt Pacifist Flip? The Combat Celebrant thing happened to me. There were two Combat Celebrant an Aether Chaser a Town Gossipmonger Flip and a Devoted Crop-Mate. 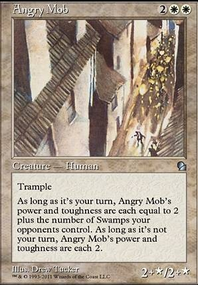 He tapped to attack with all, exerted the first Combat Celebrant, untapping all, tapping the Aether Chaser to tap the Town Gossipmonger Flip to flip it, exerting the second Combat Celebrant to untap everything again, and then exerting the Devoted Crop-Mate to bring another creature back from the graveyard and then I had to figure out how to block them all for multiple combat steps. Amonkhet brought a lot of great cards to RW Humans, Honored Crop-Captain being one of them. I've been playing the deck for a few months now and definitely have some suggestions. 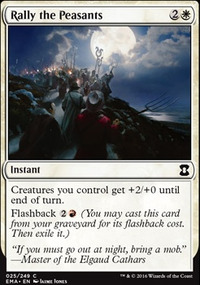 4x Always Watching is simply a great anthem with fantastic synergy with Humans that can be exerted.4x Glory-Bound Initiate combos well with Always Watching so that you can swing with a 5/5 Lifelink turn after turn. 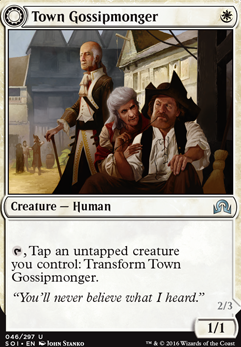 Replace Village Messenger Flip with Town Gossipmonger Flip, I recently made this switch and it's brought me more success than you may think. Gossipmongers can also be flipped in response to blocks if you have an Always Watching out. Metallic Mimics don't do well when played on curve, and do a worse job of beefing your board state than Always Watching as they don't provide any bonus to previously played humans with the exception of the Lieutenants. Devoted Crop-Mate as a 2-of works wonders, bringing back 85% of your creatures and potentially providing a pseudo combat trick if you can bring back a Lieutenant. Yes, Town Gossipmonger Flip does cause another creature to tap, so T1 Gossipmonger, T2 any creature- DO not attack with gossipmonger, leave to block. On opponent's end step use the Gossipmonger's ability to tap creature and flip. T3 untap both creatures and get aggro. Blessed Alliance has been the main life gain trick to flip Lone Rider in my games. but any trick you can use to get him up to 3 power when it attacks can work. I've been on the fence about The Mage... 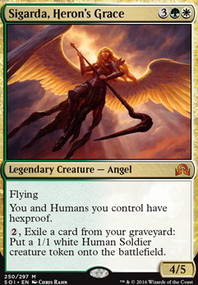 I'll move him to sideboard for now 'cause Gods, Avacyn, and others are running around. Can Town Gossipmonger Flip force another creature to tap with it's ability? (a la Springleaf Drum). That definitely feels like an include if it does. Gorger is played simply because a one mana 2/1 fits the game plan. I've always felt good about playing it, even if the ability isn't relevant here. Mimic is neat. I playtested with Thalia's Lieutenant some time ago. I wasn't a fan. I'm super tempted to play Lone Rider Flip, but then I have to include some lifegain/tricks like Tandem Tactics. If I do include him, do you have any mainboard suggestions? 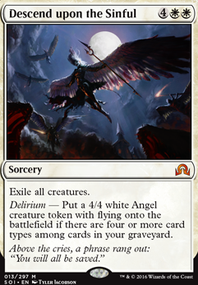 Heya, nice to see a deck that isn't copy//pasted, but there's some non-synergy that cards that you can swap. Soul-Scar Mage can be replaced by Thraben Inspector or Town Gossipmonger Flip. There aren't enough spells to make prowess worth it, and there isn't enough non-combat damage for the ability to have much impact. If you keep it in, add more spells that do damage; Magma Spray and other red spells. The Human synergy can't be over looked and should probably be exploited by playing cards like Metallic Mimic and Thalia's Lieutenant. 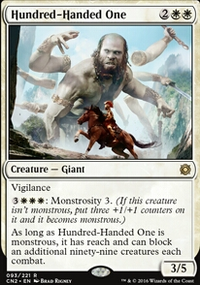 If you run 31 creatures they should interact with each other by being tribal. Falkenrath Gorger is the only Vampire. Probably cut it. Bloodlust Inciter is super cheap and a decent 1 drop. It's human. It gives haste. It's a budget add that has to be considered. Another notable budget human is Lone Rider Flip. It plays well with Blessed Alliance and Authority of the Consuls. And the most obvious add for exert and white is Always Watching . Because you have Hazoret you're looking to empty your hand so Needle Spires is a good land to run. It's a land. It's a double strike creature when you need one. 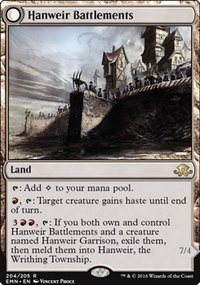 Also, Hanweir Battlements is totally worth it for the haste ability. If you stick in the battlement, stick in the Hanweir Garrison. It adds tokens when it attacks and flips late game to finish with style. I think that you may be playing too much lands, depending on the curve 20-22 lands will be fine, also you need to add more 1-drops like Expedition Envoy and Town Gossipmonger Flip, for more consistence, and always play a 1-drop in turn 1, maybe you can cut one of the Stitcher's Graft, if you drew 2 of them that could be bad and you would prefer to have one more creature. For using exert, have you considered Devoted Crop-Mate?, i think is just great for weenie decks.